Rebellious Jukebox: Is There Anyone Out There? In most of my blog posts my intention is to introduce some of you to new music, hopefully get you to check out a record I've recently bought or see an artist if they're playing nearby. 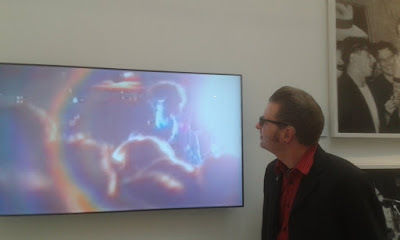 This time I'm writing about an exhibition that has now finished but whether you caught it or not, it will hopefully get you thinking about past events buried in the murky depths of your memory. The Click Club was a regular event started by local promoters Dave Travis and Steve Coxon, running from 1986 to 1990, with many bands from the Midlands and beyond playing on a frequent basis. I recently attended the exhibition curated by music historians from the Birmingham Centre for Media and Cultural Research with assistance from Dave Travis, who loaned many items from his archive including tickets and a huge array of gig posters. The Click Club was located at Burberries, a venue halfway up Broad Street next to where the Lee Longlands furniture store stands. The site of the club itself is now just an empty space, a pile of rubble fenced off in a very noticeable contrast to the tacky bars that overrun that part of town. As many of you know, I keep a diary of gigs I attend but I didn't start keeping regular notes until around 2004 so the entries before then are patchy, filled in from ticket stubs and memory. I'm always grateful for an opportunity to fill in the gaps. There's only one entry for Burberries in my diary and it's possible that I went to one other show there, but I think that was all. 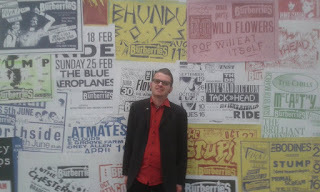 The first thing that greets visitors to the Parkside Gallery is an enormous wall of posters for gigs from one of my favourite periods of music. The Click Club coincided with my late teens. 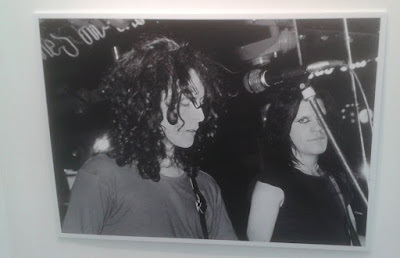 I had just begun listening to John Peel and was introduced to bands such as The Wedding Present, McCarthy, The Mighty Lemon Drops, all of whom are featured here. Unfortunately I hadn't started going to gigs at this point so I'm overwhelmed by this view of the flipside of my teenage memories. 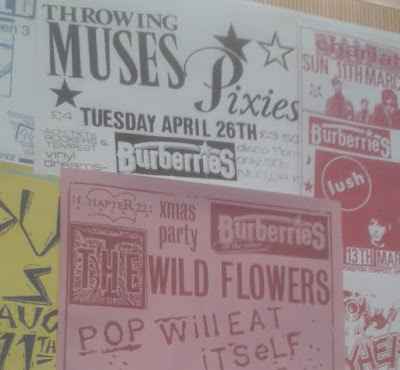 One poster that catches my eye is right at the top of the wall - Throwing Muses and Pixies for the bargain price of £3.50. You'll be surprised to learn that despite being a massive fan of both, I've never seen the Pixies and it wasn't until 10 years ago that I first saw Throwing Muses. The date on the poster is 26th April 1988 - one year before I moved to Birmingham. How I wish I'd been born just a little bit earlier. 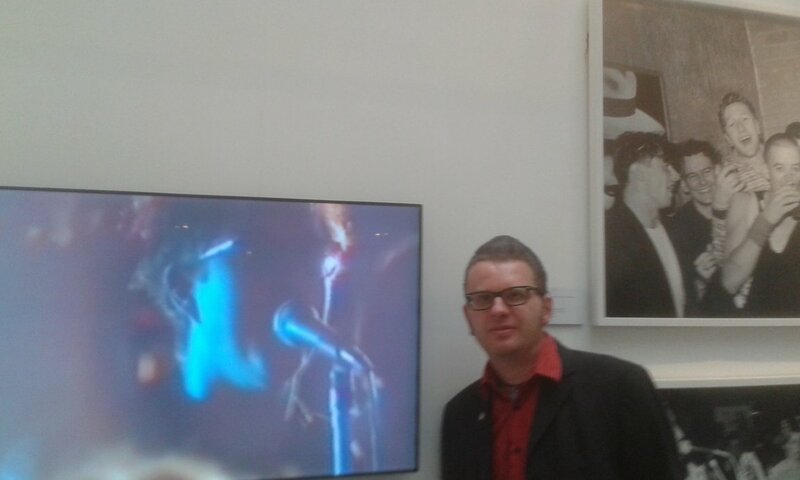 One of the key aspects of any archive is reminiscing with others and it's good to have Jez Collins of BCMCR on hand to discuss gig recollections. He manages to fill in a few gaps in my memory by discussing gigs not just at the Click Club but at other local venues around the same period. It's encouraging to see that someone who was around at the time is still enthusiastic about the music of that era and keen to share his experiences with other music lovers. As well as a promoter, Dave Travis was also a photographer with his pictures often appearing in the national music press. On display we see his photos of many bands who played at the Click Club. The curators are actually offering one of the prints as a prize for those who give feedback on the exhibition - but please don't think that's the reason I'm writing this article! It would be difficult to choose just one of these to put on my wall. Alongside the aforementioned Throwing Muses gig, we have That Petrol Emotion's Steve Mack (I've explained before how he was something of an icon for me) plus a great shot of Edwyn Collins holding a newspaper article about himself. Sharing wall space with Primal Scream, Killing Joke, Frank Sidebottom, we have of course all the obvious Midlands heroes - Mighty Lemon Drops, Pop Will Eat Itself, The Wonder Stuff. I often feel it's something of a liberty to take photos of gallery exhibits but in this case it's encouraged and Jez actually offered to take a picture of me standing with some of the posters. I do feel guilty about the number of snaps that I came away with and won't include too many of the artist photos here as it would be effectively exploiting someone else's work. Having said that, I do feel the need to share this one of The Wonder Stuff as it captures the late Rob "Bass Thing" Jones at his best. This photo was taken around the time of the debut LP "The Eight Legged Groove Machine", one of the records that epitomises that era for me so maybe this is the picture I would be most likely to hang on my wall. Some of the lesser known but no less worthy Midlands acts are also on display - The Sea Urchins, Mighty Mighty, and most interestingly The Lilac Time featuring Stephen "Tin Tin" Duffy. I know I saw them in the early '90s but the date and venue are missing from my diary so perhaps it was this gig. The most surprising aspect is the number of international bands, notably Suicide and The Sugarcubes. Many touring artists now skip the Midlands entirely so it's amazing to think that bands of that stature regularly played in a venue of this size. It's hard to comprehend that despite our thriving local scene we now miss out on so many established acts. I wonder if anyone, perhaps even the exhibition curators, can shed some light on why artists seem determined to avoid us. More importantly, what can we do to persuade bands and national promoters that we are just as deserving of a visit as we were back in 1990? Alongside the photos and memorabilia there are also video screens on a four-hour loop showing clips of some of the bands who played at the Click Club, including one gig that I definitely attended: The Blue Aeroplanes, Sunday 25th February 1990. This was a very important evening for me, only the second proper gig that I'd been to. (We don't talk about the first!) Despite all that has happened since, this gig remains one of my all-time favourites half a lifetime later so it was fascinating to be able to watch it again. I tried to spot myself in the crowd but I can't remember where I was standing or even exactly what I would have looked like at the time. It also reminded me that the support act was Elizabeth Jane so I'm able to fill in a few more details in my diary. This collection of photos and posters has given me a great sense of nostalgia mixed with a tiny bit of regret that I missed so many of these events, sadness that I didn't make the most of my younger years and take advantage of the wealth of music going on around me. This was partly down to lack of funds but mainly due to having few friends with similar tastes. In the days before the internet it was hard to find out about events if you didn't have the right contacts. Nevertheless, I'm proud of the homegrown talents on display. Many of them, such as Mighty Mighty and Fuzzbox, have seen a resurgence of late and I run into their members on a regular basis. Although I often bemoan my own lack of musical talent, I'm glad of the minor role I have in our local music scene and hope that my writing persuades others to get involved.